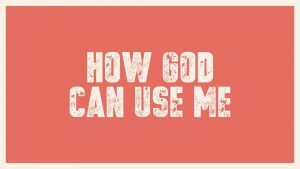 You might think- “Can God really use me?” The answer is YES! Each person has natural talents and abilities, which are given by God since mankind is created in God’s image. But Christians also have spiritual gifts, given by the Holy Spirit to each person “as he wills” (1 Corinthians 12:11). God has given each person spiritual gifts so that he or she can make a valuable contribution to the body of Christ, and also so that each person can care for one another. God has designed the body of Christ, the church, so that we need one another and also look out for one another. When people are using their spiritual gifts the right way, others will notice that the Holy Spirit is at work, because He empowers people to do things beyond their natural abilities. Listen and be encouraged!